Upanda sita karapu paw natha warak wandoth Kelaniya - They say that all your sins will be washed away if you set foot once in Kelaniya, the land Lord Buddha famously visited thousands of years ago on a Vesak Poya day. And the stresses of the harried mind are swept away on stepping into the hallowed halls of the Kelaniya temple’s shrine room, where the incomparable murals of Solias Mendis capture the imagination. ‘Tis the season of Vesak…lanterns adorn where previously a light bulb hung, schoolchildren dust off their lama saris and national dress in preparation of sil observation, and Buddhists and non-Buddhists alike attempt artistic masterpieces with their painstakingly constructed Vesak kudu. It’s that time of the year when temples are full. With this year’s Vesak holiday falling on a weekend, it’s the perfect opportunity to explore the beautiful masterpieces of Buddhist culture, the murals in temple shrine rooms that depict the Buddha’s teachings. Kelaniya, is important to Buddhist devotees for many reasons; the primary one being Lord Buddha’s visit to Kelaniya in order to settle a dispute that had erupted between the Naga Kings – Chulodara and Mahodara- over a gem studded throne. Significantly this visit was on a Vesak full-moon Poya day. The history of temple murals in Sri Lanka dates far back to the time of King Dutugemunu, says Professor Albert Dharmasiri, a scholar well versed in Buddhist art. “However the only reference to the Dutugemunu-era murals comes in the Mahavamsa which mentions that the Ruwanvelisaya inner shrine room contains these murals,” he added. The classical era of murals flourished in the Polonnaruwa era, with the Thivanka Pilimageya containing the largest complement of mural paintings from this time. Other significant classical works include the murals at the Gal Vihara temple. “With the decline of the Polonnaruwa civilization, mural painting also became stagnant,” explains Prof. Dharmasiri. It was under the patronage of King Kirthi Sri Rajasinghe in the 18th century that Buddhist mural painting was revived, with the Kandyan style of painting evolving into the standard that many artists of the latter centuries used for their work. The Kelaniya Raja Maha Viharaya exemplifies the art of Buddhist murals in Sri Lanka –in the eyes of the common man as well as the experts. “The works of art date back to 1767, where several different artists hailing from the Dorana Gurukula worked at different times to depict portrayals of the Jathaka katha (Buddhist moral stories) and the Solosmasthana (the 16 sacred places in Sri Lanka, believed by Buddhists to have been hallowed by visits of Lord Buddha) in an artistry that closely followed that of the Kandyan era,” says Ven. Kollupitiye Mahinda Sangharakkhitha Thera. The Kelaniya Raja Maha Viharaya owes much to the munificence of Don Helena Wijewardene who devoted her time to the restoration of the Raja Maha Viharaya. It was on visiting the Kelaniya Viharaya on a Poya Day in 1888, that Don Helena, shocked at the dilapidated condition of the Viharaya which was ravaged by the Portuguese, determined to restore the temple. Restoration work began in 1902, and by 1927, Don Helena engaged the services of Solias Mendis (who was only 30 at that time) to restore and paint new murals at the temple –Solias was 50 by the time the murals were complete; such is the meticulous precision entrusted in the details. Solias received his education at a Pirivena under the tutelage of his uncle, and developed an abiding love for the Jataka stories the other monks would often relate. 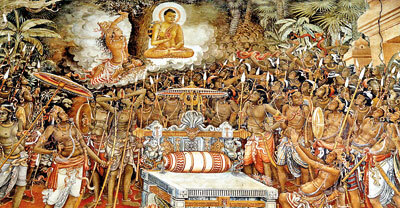 When he was commissioned to paint the murals of Kelaniya he chose to depict Sakyamuni Buddha’s several visits to Nagadeepa, Kelaniya and Mahiyangana; the protection given to the Buddha’s Tooth Relic which was concealed in the knot of hair of Princess Hemamali; the historic landing of Prince Vijaya at Mahantita (modern Mannar) along with his 700 men; commentator Buddhagosha’s presentation of the Visuddhimagga to the Sangharaja of the Anuradhapura Maha Vihare; the consecration of the Most Venerable Welivita Sri Saranankara Thera as the Sangharaja of Kandy, and several other historic events associated with Buddhist history, in addition to the traditional Jataka stories of importance. These are iconic images in Sri Lanka, often reproduced in the telling of Buddhist tales. “The initial paintings in 1767 are two-dimensional and have procured a limited range of colours, which adds to the composed charm, while the works of Solias Mendis in 1927 are three-dimensional,” the Chief Incumbent explains. We learn that Solias Mendis was influenced by the works of Sigiriya, Lankathilaka and the Ajantha caves in India. “He has amalgamated the works of these three styles into beautiful depictions at Kelaniya,” the Chief Incumbent comments. Prof. Dharmasiri opines that the Kelaniya murals are among some of the best works of the 20th century. He firmly believes that Solias Mendis along with George Keyt and Somabandu Vidyapathi breathed new life into mural painting in Sri Lanka. Somabandu completed the Bellanwila murals in the 90’s while Keyt accomplished the mammoth task of painting the Gothami Viharaya shrine room in a mere four years. At the Gothami Viharaya the style of art is quite different. Chief Incumbent Ven. Thelwatte Nagitha Thera points out that Keyt’s work was much more concupiscent than the traditional Buddhist artwork. “There was a great uproar at the time it was painted (from 1938 to 1941), as people were outraged over the sensual nature of the images,” he says. These murals depict the main events of Lord Buddha’s life, including his Birth, Enlightenment and Passing Away. Interestingly enough, the image depicting Lord Buddha giving his first sermon has the figure of then Chief Incumbent of the temple Venerable Thelwatte Amarawansha Thera listening with rapt attention. Keyt is said to have painted the Ven. Amarawansha Thera as a mark of respect. Keyt was commissioned to do the Gothami temple murals by Harold Peiris, who was married to Keyt’s sister, and did not charge a fee for his work, the only cost being for the paint used (at that time Rs. 35 000, an astronomical amount). While Kelaniya is seen by many as the pinnacle of Buddhist murals, many temples such as the Gothami Viharaya and the Isipathanaramaya and others, lesser known, dotted across the land, have beautiful murals. Many believe that the future of murals should spring from thoughts of pristine Buddhist spiritualism, which takes into consideration the traditions and artistry that was handed down by our forefathers. One of the most striking paintings at Kelaniya is that of the Buddha positioned in a heavenly levitation, looked upon by the gods as He preaches to Chulodara and Mahodara, over the magnificent gem-studded throne. The Buddha’s preaching was that all things material will soon wither and die. The spiritual enactment that the painting has succeeded in portraying is surreal, but the message that it reiterates this Vesak may be a bit closer to our hearts than we assume. As we leave the halls of the shrine room, the realization that there is no purpose in holding onto possessions studded by the vicious gems of hate and greed fleets across our minds – a realization that we need to open our eyes to, this Vesak, the month that the Enlightened One graced our land.